The global bleeding disorders treatment market is projected to reach USD 15.09 Billion by 2021 from USD 10.33 Billion in 2016, at a CAGR of 7.9% from 2016 to 2021. The global market is broadly classified into type, drug class, and region. Based on class of drug, the bleeding disorders treatment market is segmented into plasma-derived coagulation factor concentrates, recombinant coagulation factor concentrates, desmopressin, antifibrinolytics, fibrin sealants, and others. The recombinant coagulation factor concentrates segment is expected to witness the highest growth rate in the market. This growth is attributed to rising R&D activities and increasing focus of pharmaceutical companies on recombinant products resulting in launch of new products. For the coming five years, APAC and LATAM regions are considered to be the lucrative markets for the bleeding disorders treatment market. Growth in this region can be attributed to increasing initiatives by local governments for increasing access to healthcare, rising disposable income, and increasing focus of global players towards emerging economies. The key players in the bleeding disorders treatment market are Shire Plc. (earlier Baxalta) (Ireland), Bayer AG (Germany), Biogen Inc. (U.S.), CSL Behring (U.S.), Novo Nordisk (Denmark), Pfizer Inc. (U.S.), and Grifols SA (Spain). This report aims to provide insights into the bleeding disorders treatment market. It provides valuable information on the market by type and by drug class, in the market. Furthermore, a geographical analysis for these segments is also presented in this report. Leading players in the market are profiled to study their product offerings and understand their strategies to remain competitive in this market. The above-mentioned information would benefit the buyer by helping them understand the market dynamics. In addition, the forecasts provided in the report will enable firms to understand the trends in this market and better position themselves to capitalize on the growth opportunities. The global bleeding disorders treatment market is expected to reach USD 15.09 Billion by 2021 from USD 10.33 Billion in 2016 at a CAGR of 7.9% from 2016 to 2021. The major factors driving the market growth include the growing patient population base, R&D activities, and increasing focus on recombinant products by pharmaceutical companies. Emerging markets offer significant growth opportunities for the market. On the other hand, high treatment cost for bleeding disorder treatment products coupled with limited reimbursement is expected to hinder the growth of this market during the forecast period. The global bleeding disorders treatment market is broadly classified by type and drug class. Based on type, the market is classified as hemophilia A, hemophilia B, vWD, and others. Hemophilia A is the largest segment and is projected to witness a healthy CAGR in forecast period. The growing number of patients suffering from hemophilia A, coupled with increasing awareness, and increasing R&D activities for development of novel products for treating hemophilia A by major pharmaceuticals are key drivers for this market segment. Based on drug class, the bleeding disorders treatment market is segmented into plasma-derived coagulation factor concentrates, recombinant coagulation factor concentrates, desmopressin, antifibrinolytics, fibrin sealants, and others. The recombinant coagulation factor concentrates segment is expected to witness the highest growth rate during the forecast period. This increasing focus on developing recombinant factors due to their high efficiency in preventing bleeding episodes over plasma-derived products are driving their market demand. 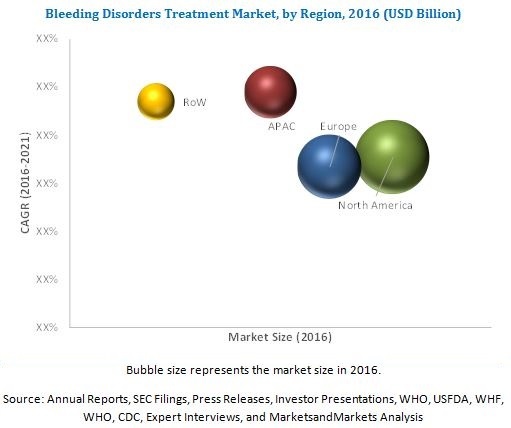 The global bleeding disorders treatment market is dominated by North America, followed by Europe. North America will continue to dominate the global market in the forecast period. The high acceptance for prophylaxis treatment among all age groups in the U.S. is a key market driver in the region. The key players in the bleeding disorders treatment market are are Shire Plc. (earlier Baxalta) (Ireland), Bayer AG (Germany), Biogen Inc. (U.S.), CSL Behring (U.S.), Novo Nordisk (Denmark), Pfizer Inc. (U.S.), and Grifols SA (Spain).